Kyle Larson’s balky No. 42 Chip Ganassi Racing Chevrolet qualified 34th on Saturday. 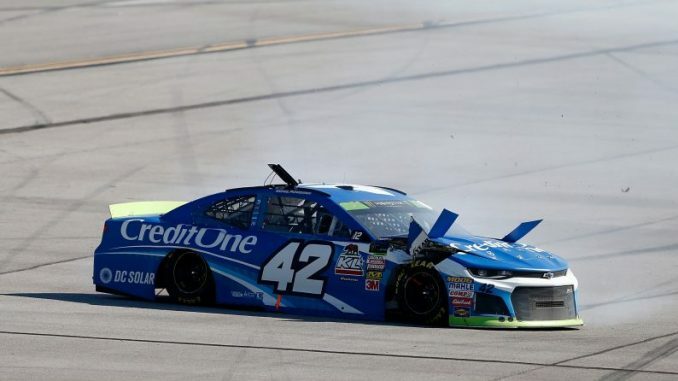 After unapproved adjustments to the car, Larson started last in Sunday’s 1000Bulbs.com 500 at Talladega Superspeedway. Timely cautions and attrition, however, came to his rescue. Larson got his lap back as the beneficiary under caution for the end of Stage 2, and after spending most of the afternoon running mid-pack, he dodged late accidents to finish 11th—a miraculous result given the lack of strength in his car. With the Round of 12 cutoff race at Kansas set for next Sunday, Larson faces elimination from the Monster Energy NASCAR Cup Series Playoffs. He’s 11th in the standings, 26 points behind reigning series champion Martin Truex Jr., who is currently in eighth place.